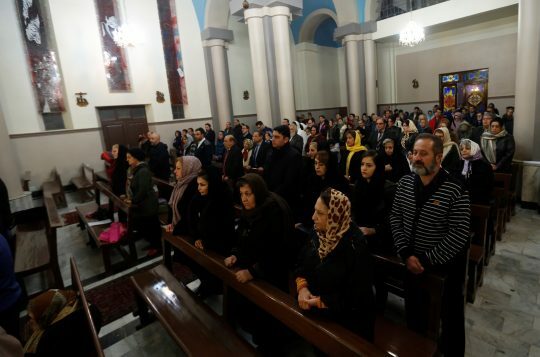 The Iranian government's persecution of Christians increased over the past month, according to information gathered by the nonprofit International Christian Concern. Earlier this month, Iranian President Hassan Rouhani claimed Christians have the same rights as others do in Iran. Despite the claim, a report from ICC, a Washington-based nonprofit that assists religious minorities from persecution through assistance, advocacy, and awareness, points to evidence from the month of July showing Christians have been targeted by the Iranian regime. Eight believers faced judicial action, "a noteworthy increase of publicized cases of Christian persecution in Iran," according to ICC. Christian Solidarity Worldwide, another organization dedicated to supporting Christians suffering persecution, issued a statement that observed, "as the Iranian regime has grown more unpopular and citizens have become more vocal in their criticism of corruption in official circles, the government has become increasingly reliant on the support of hard-line ayatollahs, who favour increased pressure on religious minorities." Similarly, ICC’s regional manager, Claire Evans, said "the persecution of Christians in Iran is increasingly building as the regime struggles to maintain its grip over the hearts and minds of its citizenry." A struggling economy has fed protests in Iran over the past eight months. In December and January, over two dozen people were killed and almost 5,000 were arrested during protests. Last month, three days of protests in Tehran included clashes with police outside the country’s parliament. During a speech at the Ronald Reagan Presidential Library last week, Secretary of State Mike Pompeo offered a message to the people of Iran. "The United States hears you; the United States supports you; the United States is with you," he said. Last week’s Ministerial to Advance Religious Freedom, which was hosted by the State Department, released a statement condemning Iran’s "systematic, ongoing, and egregious violations of religious freedom." "We strongly urge the Government of Iran to cease its violations of religious freedom and ensure that all individuals – regardless of their beliefs – are treated equally and can live out their lives and exercise their faith in peace and security," the statement reads. This entry was posted in Issues and tagged Iran, Religious Freedom. Bookmark the permalink.